The establishment of Oil Palm (Elaeis guineensis) plantations is responsible for massive rainforest clearing and destruction throughout the tropics of Southeast Asia and beyond, and has captured the attention of conservation organisations around the world. One such organisation is Rainforest Rescue (RR), a not for profit Australian based conservation NGO. Through local and international projects (including in the Daintree region of Australia and Sumatra in Indonesia) RR has undertaken conservation actions that include removal of Oil Palm plantations to re-establish rainforest close to National Park areas. The rainforest of the Daintree region provides an active window into the evolution, biogeography, and ecology of the southern (Gondwanan) rainforests, and their interaction with Indo-Malesian floristic elements. It has many (ca. 120) federal- and state- listed Threatened, Vulnerable, Of Concern, and Rare plant and animal species and a range of rainforest types. 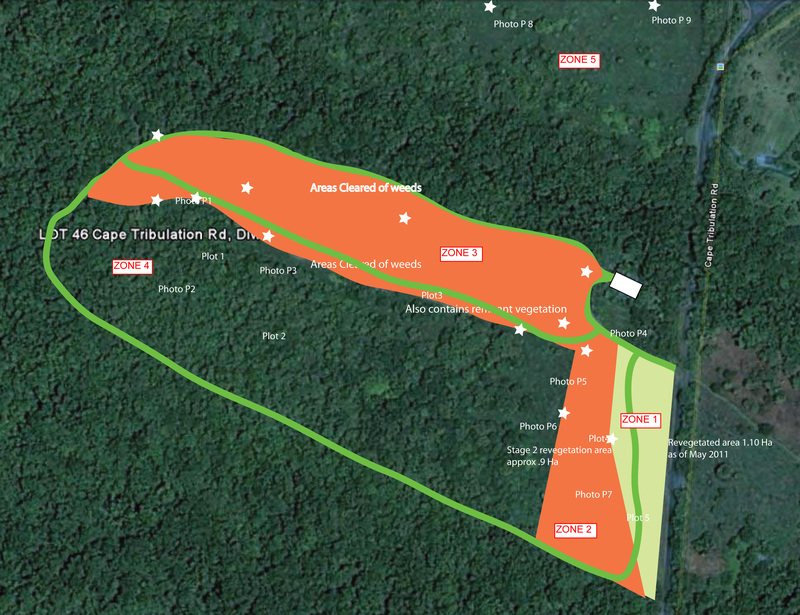 To achieve restoration of a small (27.6 ha) but important piece of the global distribution of lowland tropical rainforest, RR purchased Lot 46 Cape Tribulation Road in the Daintree area of far north Queensland, Australia in 2010 and, in 2012, secured funding to set the property on its long journey back to rainforest. The on-ground works. The property was divided into five working Zones as part of the restoration planning process (Fig. 1). 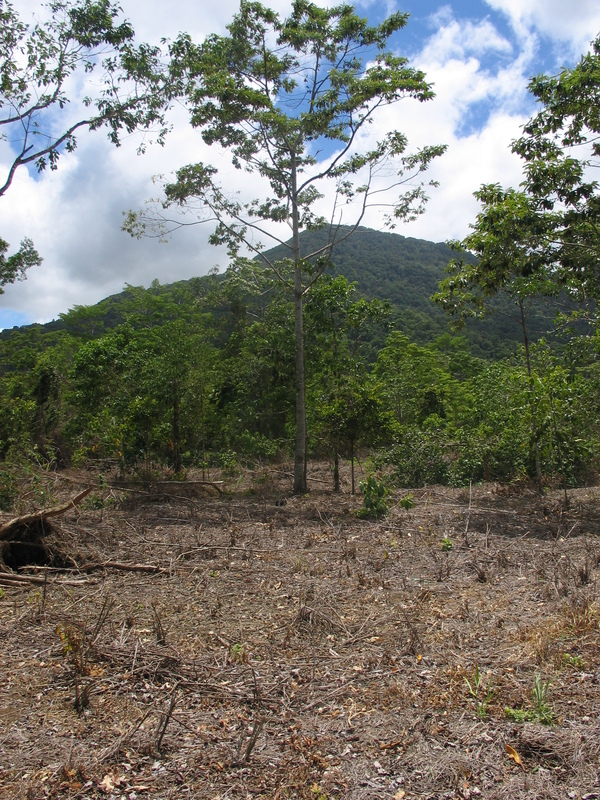 Because of a nearby large seed source forest a key objective of the project is to maximise and protect natural regeneration, as well as planting larger openings. Up to 30,000 trees representing 100 species are expected to be planted during the 2-year life of the project, with around 10 ha of natural regeneration interspersed. Trial tree plantings were undertaken in early 2011 and 2012, and selective weed management (herbicide based grass and soft weed control) began at the same time to optimise natural regeneration prior to identifying and preparing suitable planting sites. Plantings. The planting trials were each one hectare in area and designed to test the efficacy of two different high diversity (60-90 species) planting designs. In Zone 1 tree spacing was 2.5m, and in Zone 2 the spacing was 1.5m. 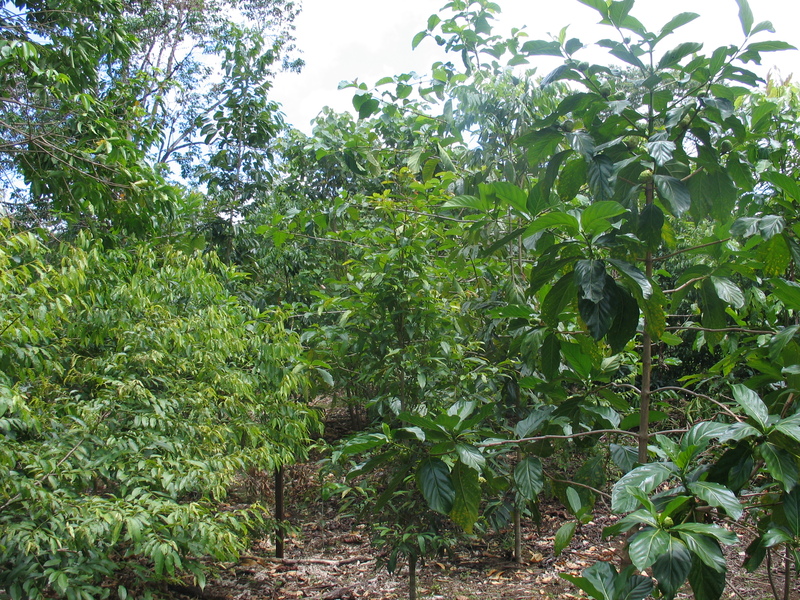 Seedlings for rainforest plantings were propagated and grown in the RR nursery in the Daintree lowlands. Seed collection was undertaken north of the Daintree River and included seed collected from the property. A low number of vines were included in the species mix for subsequent plantings. A total of 90 species have been planted to date. The species mix included some early stage (pioneer type) tree species from genera such as Polyscias (Araliaceae), Alphitonia (Rhamnaceae), Macaranga (Euphorbiaceae) and Commersonia (Malvaceae); and tall fast growing species such as Elaeocarpus grandis (Elaeocarpaceae) and Aleurites moluccana (Euphorbiaceae). The remaining species represented mostly moderately fast growing species, and some slower growing mature phase rainforest species. Weed control. Where possible, large Oil Palms were removed mechanically, but to protect existing rainforest regeneration many required stem injection with herbicide. Several methods are currently being trialled to determine the most time and cost effective approach to controlling this large and difficult weed. Late in 2012 and early in 2013 extensive mechanical and chemical weed control was undertaken in Zones 3, 4 and 5 (Fig. 1). This included mechanical clearing of large areas dominated by Giant Bramble (Rubus alceifolius) and other weeds, and some mechanical removal of Oil Palm seedlings on the southern side of the creek that traverses the property (Zones 3 and 4). Follow up chemical control (systematic backpack spraying of glyphosate) was conducted immediately (as required) to complete the site preparation for planting. This was targeted at grasses, broad-leaf weeds, and regrowth of woody weeds. Monitoring design. Monitoring plots (7 / 50 x 20m plots, each with 10 / 10 x 10m subplots) and permanent photographic points (12 in total, 7 in association with monitoring plots) were established in the five working Zones. Cover, number of species and density will be recorded in these plots at each stratum at 12 month intervals. One monitoring plot was established in each of Zones 1 and 2, three in Zone 3 (including directly adjacent to Zone 4), and two in Zone 5 (in the north of the property; yet to be measured). Zone 4 will be monitored visually and by photo point as it is mostly natural regeneration enhanced by weed control. Preliminary Results. The first round of project monitoring (year 1 establishment) provided base-line information for future development of the plantings and natural regeneration through assessing canopy cover, leaf litter cover, and a range of other factors that will change over time (Table 1). Informal observations have shown that site dominance was achieved by the trees planted 12 and 18 months ago in Zones 1 and 2. Substantial numbers of wildling seedlings (of up to 11 species in a plot; and 15 in total) were found in the sites monitored prior to more recent planting. Mechanical weed control was reported to be extremely effective and the operator was able to minimise damage to existing regrowth of species such as Melicope elleryana (Rutaceae), Glochidion harveyanum var. harveyanum (Phyllanthaceae), Macaranga involucrata var. mallotoides (Euphorbiaceae), Polyscias australiana (Araliaceae), Rhodamnia sessiliflora (Myrtaceae), Alphitonia incana (Rhamnaceae) and Aidia racemosa (Rubiaceae). In combination with the early implementation of broad and targeted spraying this maximised the retention of substantial existing saplings and seedlings. Project funding will cease in 2014, and control of all weeds and rainforest establishment is expected to be completed in 2015; with only minor weed control required thereafter once canopy cover is established. Monitoring will continue at 12 month intervals and inform future publications. Acknowledgements: The project is dependent on the generous support of RR donors and the on-going efforts of RR staff in FNQld. Funding for the project was provided by a Federal Government Biodiversity Fund Grant. Figure 2 Mechanical weed control in Zone 3 (January 2013) prior to planting. Note remaining natural regeneration. Figure 3. Newly planted trees in Zone 3 (March 2013). Note surrounding natural regeneration. Figure 4. Zone 2 planting trial established in late 2011 at 18 months. Tree spacing at 2 – 2.5m. Table 1. Synthesis of baseline data for natural regeneration, and progress (including planting) up to February 2013 measured on (50 x 20m) permanent monitoring plots (PP), in Zones (1,2,3), by Themes (1 – planting; 2 – natural regeneration). PD – total planted diversity on plot; PS(n) – number of seedling planted on plot; WS – wildling seedlings (0.5-1m in height); WD – wildling diversity; Av. CC(%) – Average Canopy Cover (%); Av. L(%) – Average Litter Cover (%); Av. LBC(%) – Average Log-Branch Cover (%); Av. 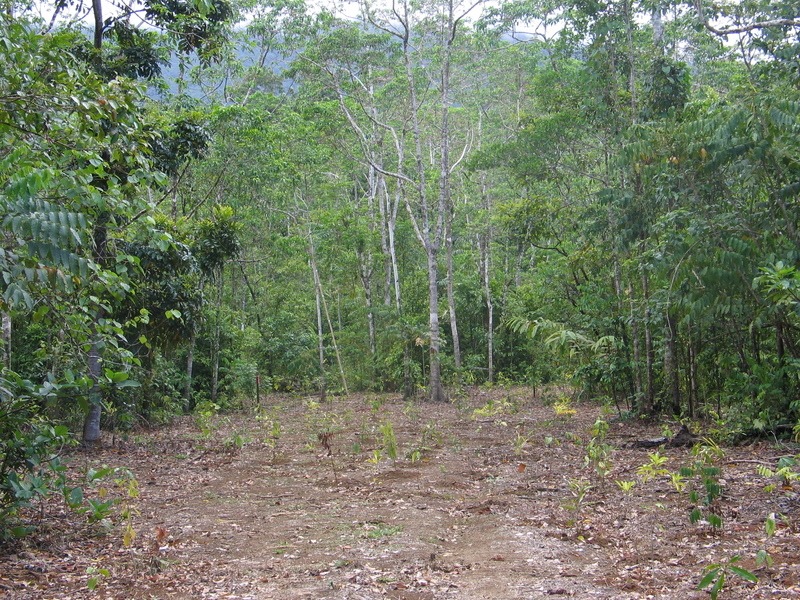 PCHt – Average planted canopy height (m); dbh – diameter at breast height (1.3m); NR – Number of stems, natural regeneration >1cm DBH; NR-div – Diversity of natural regeneration >1cm DBH; Age (mths) – Age of planting in months. Zone 4 (not shown) has permanent photo points and visual monitoring. Appendix 1 List of main weed species located and treated on the property. This entry was posted in Assisted regeneration, Organisations, Pest animal issues & solutions, Queensland, Rainforest, reconstruction, Restoration & management theory, Standards. Bookmark the permalink.